There’s just one week left to support our petition to ask government to fund more research than ever before. More than half of us have a close friend or family member with dementia, and with no treatments to stop or cure the diseases that cause it, no-one has yet survived. But breakthroughs in dementia research can and will change lives, and increased funding from government can help make it possible. 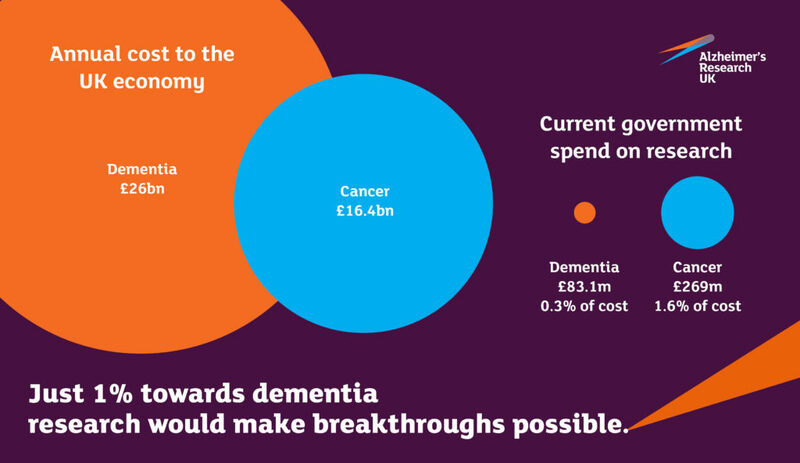 Right now, dementia costs the UK a massive £26 billion a year. Government spending on research is equal to just 0.3% of this cost – so we’re asking for an increase to 1%. Over 29,000 people have signed our petition so far. More signatures will help us show the government how much support there is for dementia research. Take just two minutes to sign the petition. After signing, tell your friends. Share these posts on Twitter and Facebook. Or write your own post using #just1percent, tagging Alzheimer’s Research UK, and including the link to the petition.